When you are creating a new application form or webform in your workspace, there are two related components utilized to accomplish this task: the Form Builder and the Form Settings. The Form Builder is where you actually build the fields on your form and manage its look and feel. The Form Settings, on the other hand, pertain to things like your form's URL, close date, and confirmation email. The steps below outline the most essential settings under Form Settings, but you can gain an overview of all settings here. 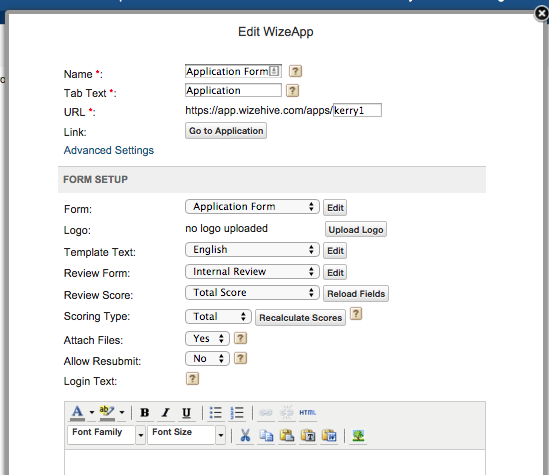 To access the form settings, you should be on the tab of the application form or webform in question. Then click the Form Settings button. Now let's go ahead and walk through some of the most important functions of which one should be aware; these fields are all required and thus must be completed in order to save your Form Settings. These are the top three fields of Form Settings and are important for identification purposes. Name: This is how your form will show up in someone's browser tab when they are accessing the form as an application. You'll see that we named our form Application Form. When we open it up in our browser, here's how it looks. Tab Text: This will be the name of the tab in your workspace that holds your form. We called ours Application, and you'll see there is a corresponding tab called Application in the workspace. 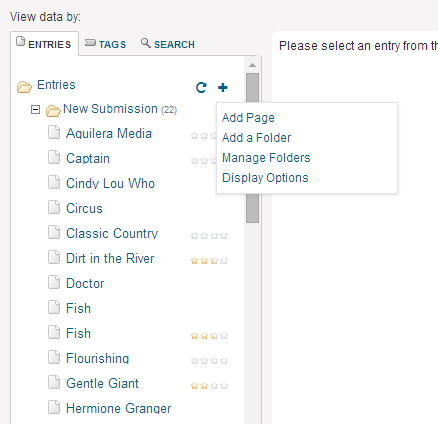 In your workspace, you'll see a folder panel, with folders like New Submission and Drafts. Within that folder are your draft and submitted applications. You can choose 1-2 field responses off the form to identify the applications in this area. You'll see in the folder panel below that we opted to use the fields First Name and Last Name. For example, in the New Submission folder, the third entry is called Cindy Lou Who. This is because the applicant entered Cindy Lou in the First Name Field, and Who in the Last Name field, and we had designated First Name and Last Name is the Entry Name Fields. You can select any field from your application that will best assist with identification purposes. You may want to select Proposal Title, University, etc. This Entry Name will also show up in reports, as well as above the application when viewing it in the backend. To set these fields, go the Data Management section of Form Settings and observe the first two dropdowns: Entry Name Field and Entry Name Field 2. It is only required that you choose one Entry Name Field, but you have the option of selecting two. When you click the dropdown, you will see all of the fields in your form. Choose the field(s) you would like in order to set the Entry Name. If you have just built your form, you may need to click Reload Fields in order for the new fields to appear in the dropdown. If you already received entries and want these entries to also show the naming convention you have chosen, you can click Rebuild Names to apply the Entry Name retroactively. Let's move on to the Communication section. When an applicant clicks Submit, two things happen simultaneously: he/she receives an on-screen submission confirmation, and he/she receives an email confirmation in his/her inbox. Here is where you control those settings. Reply-To Address: The first required field we have here is the reply-to. 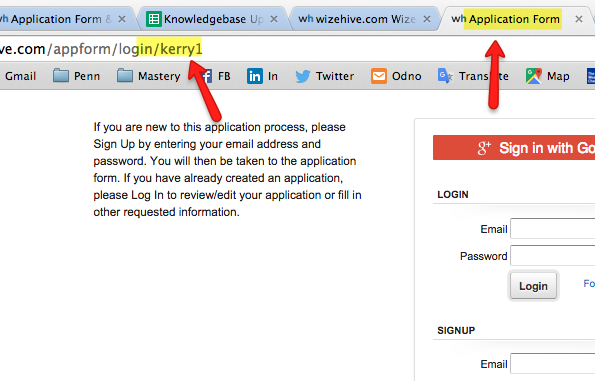 When an applicant receives this email, it will be coming from the WizeHive server. That being said, you can enter an email address here that will show up in the applicant's inbox, and which will be CCed (in addition to a wizehive.com email address) if the applicant responds to the email. Typically, users put in an organizational or general email address. Submission Email: Here, you create the body of the email which the applicant receives upon submission. Note that you can format the email text using the word processor icons above. Submission Text: The area where you enter and edit this text looks just like the Submission Email field, and is also accompanied by the ability to format text, etc. The last required fields you must complete are the Start Date and End Date. We can find these in the Advanced Settings section towards the bottom. 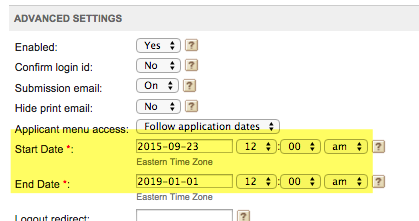 You can set your application to automatically open and automatically close at a specific date and time. Note that these dates/times are in Eastern Standard time and cannot be changed to a different timezone. End Date: If you don't know your start/end date, prefer to open and close the application manually, or have an application that is forever open and rolling, you still need to enter an End Date here. You can just put a date in the very distant future. Start Date: Regarding the Start Date, you will need to have the application open for a testing period before you release it to the public. You can put yesterday's/today's date as the Start Date, so you can have the application open for your viewing as you are building and testing it. Your application will really become live when you put the URL on your website/email the link to your applicants, so as long as you haven't publicized the URL, there is no chance of applicants locating this.